Small Brass Squeeze Horns and Brackets Click photo for larger image. Delightful smaller brass squeeze horns available directly from SqueezeHorns.com. I have two displayed here so you can see they’re not exactly alike. Each is hand made and unique. These brackets are custom made to enable attaching your squeeze horn to bicycle handle bars. One 7″ brass squeeze horn. $19. Free US Shipping. Includes 1 attaching bracket. 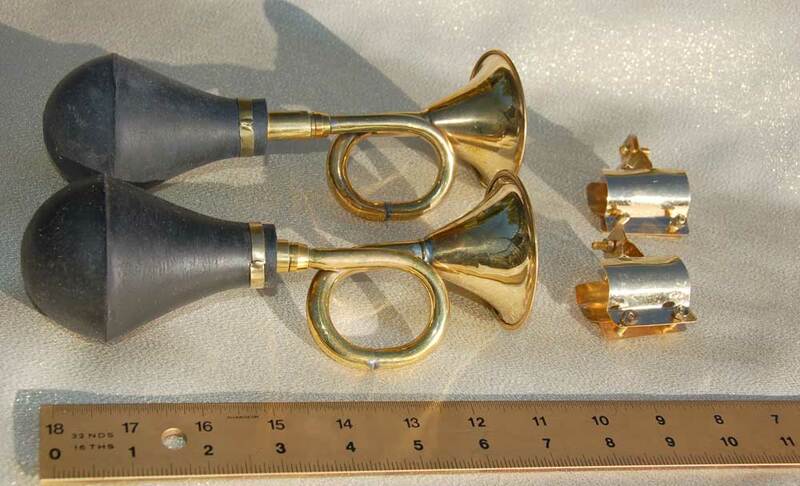 I need to order more than one squeeze horn. How do I do that?!! I need 4 of the 7″ brass horns. Hi! The way I have it set up you’d have to buy 4 of them separately. If that’s a pain, give me a call, John 1-310-314-1626. Thanks. My address is … and Id need (4) of the 7″ Brass squeeze horns. Id would need them by Thursday actually. I need them for Friday but I wont be around to pick them up so Thursday would be great!! Hi Clownboy! I got your order for the first horn. I sent you an email with more details. How do I order this horn? and the trumpet one? Also, any chance you have ones that are tuned to certain notes in 440? Or can I just order ones that are tonally different? My apologies. My living/working situation was extremely disrupted a few months ago. Things are starting to settle down but my horns are still in storage. It will be at least a few more weeks before I’m able to sell and ship horns.